"Copag's plastic playing cards of Brazil are commonly recognized as the Highest Quality and most preferred card in the world of poker. 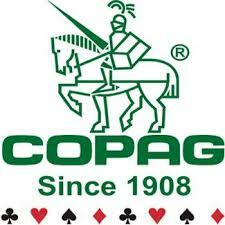 Copag Cards were used in the World Series of Poker!" BUY DIRECT: Buy Direct from Copag's Official U.S. Distributor! All Copag Inventory is warehoused in Trademark Global's U.S. Fulfillment Center. Poker or Bridge Size * Jumbo or Regular Index * Cut Cards * Peek Style * Silver Designer Series & more! Order 48 Sets or more and shipping is FREE! Combine styles to reach quantity of 48 sets!